The service specialist on the phone tells me, "Before you come in, you'll need to fill out the form on our website, print it out, and then bring a copy with you." That may work for a monopoly like the State Department, but in this case, I'll go to another shop on the list where I can just walk in. When magazines send subscribers a renewal notice, they ought to be required to clearly indicate when your current subscription expires. In font of a certain size. Sure, TED Talks are great, but Creative Morning talks are happening monthly in 36 cities around the world. And they are free. Don't let your morning self decide whether to go running. The evening self gets to decide. If you accept the somewhat artificial construct that there is not one of you but multiple, competing yous duking it out inside your head, battling for control, it is easier to change habits. My morning self is usually tired, and stiff, and doesn't want to run. If I were deciding in the moment whether to go running or not, I rarely would. Instead, I decide the night before. Then, in the morning, when my morning self objects, I treat that morning self like a junior staffer at a meeting of senior execs: "Sorry Morning Self, but you don't get a vote. We recognize that you don't feel like it, but the decision from the CEO has already been made. Lace up!" Bonus hint: going to sleep in your running shorts and tee-shirt makes it even easier. Some websites, when you register, ask for your phone number, and make it a required field. Some of them are smart enough to disallow 111-222-3333. I enter: 718-479-7990, the number to the Rejection Line. If you haven't heard of it before, give it a ring when you need a laugh. And keep the number handy for those forms. Particularly handy when buying tickets for some event, to avoid telemarketing calls in the future. Who needs to be able to write? I was chatting with a home inspector recently. He charges $400 per inspection, and generally fits in two per day, sometimes three. He is so busy that he doesn't bother advertising: if he does advertise, he gets more calls that he can handle. Not a bad living for a living that doesn't require a college degree, any significant capital investment, or following a boss's orders. If he can average two inspections per day, that is $4,000 per week, or $200,000 per year. Assuming some slow periods throughout the year, and a home inspector could at least be making $100-150K. He'd like to hire some people and send them out on inspections. But the biggest hurdle is: he can't find people who can write. After each inspection, he produces an inspection report. And almost every candidate he interviews can't write a page that isn't filled with spelling and grammatical errors. "If people want to be healthier and prolong their life span, all they really need to do is go for a walk." For a business partnership that would create some value, how about Skype joins up with LinkedIn. So you could just click on any of your contacts on LinkedIn and call them on Skype. I would think this would be a big win for both companies. LinkedIn would become more useful. And Skype would pick up more business. And you wouldn't have to go re-create your social network on Skype. but Facebook only lets you "Like." I suppose it wouldn't be very friendly to dislike the photo that your high school classmate just posted; but it might cut down on the Facebook clutter. We're all familiar with the Gandhi quote "Be the change you wish to see in the world." "I'm trying to run at least three times a week." "I hope I get an A in this class." "I'm trying to cut out carbs to lose weight." Until you make that mindset shift, the goal is something external to yourself. But once you become your goal, you are simply following your inner nature. Comparing the costs of buying new glasses for the poor vs. sending and sorting donated, used glasses. Buying new glasses is cheaper. Nice case study on the topic of hidden costs. Recycling old glasses makes people feel generous and thrifty. They believe they’re helping people and saving money. They think the glasses they donate are “free,” because they don’t consider all the hidden costs of sorting and shipping them. And they don’t realize just how cheap manufacturing new glasses has become. If they really wanted to help people see, they’d send money. Unlike leftovers, it’s guaranteed to fit. The only thing this article neglects is that donating glasses could be, from the charity's point of view, a loss leader. If people donate their glasses, it is a type of commitment mechanism, and they might be more willing to actually donate money as well. So the additional cost to the non-profit of working with used glasses could be considered a sales expense. Also, if local talent in the country where the glasses get shipped are hired to do the sorting, then that job creation needs to be factored into the calculation. A friend, Dane Zehrung, who is in good physical condition, was suffering from back pain. He sought out multiple specialists, none of whom were able to help. Then, he attended classes with the Gokhale Method. A series of classes costs $450, and he says they were definitely worth the money. Basically, they teach you proper posture: how to sit, how to walk, how to lie down properly. The idea is that we learn posture from our surrounding culture, and that our culture in the West teaches us crummy, unhealthy posture. The creator of the method studied posture in many traditional cultures, and developed a methodology to teach us that posture. The problem with digital books is that you can always find what you are looking for but you need to go to a bookstore to find what you weren’t looking for. 1. Want to be smarter? Get outside and move. It turned out that the toys and tastes, no matter how stimulating, had not improved the animals’ brains. “Only one thing had mattered,” Rhodes says, “and that’s whether they had a running wheel.” Animals that exercised, whether or not they had any other enrichments in their cages, had healthier brains and performed significantly better on cognitive tests than the other mice. They're broken because the difficult part is finding a scalable, profitable way to market and sell the solution. 3. Want to live longer? "...researchers determined that watching an hour of television can snip 22 minutes from someone’s life." French parents teach their children to eat like we teach our kids to read: with love, patience and firm persistence they expose their children to a wide variety of tastes, flavors and textures that are the building blocks of a varied, healthy diet. Pediatrician-recommended first foods for French babies are leek soup, endive, spinach and beets. Each had paid American more than $350,000 for an unlimited AAirpass and a companion ticket that allowed them to take someone along on their adventures. Both agree it was the best purchase they ever made, one that completely redefined their lives. On my street, the recycling truck passes two times. On one pass, they collect the recycling from the south side of the street; on the second pass they get the north side. The truck has one driver and one "thrower" who collects the bags and throws them into the appropriate bin. The city could save money by having one driver and two throwers. On narrow streets like mine, there would not be any additional danger to the throwers, since cars can't pass the garbage truck. So the truck could drive down the street, with one thrower working each side of the street. There would be a 25% labor savings. Instead of 2 personnel times two passes, you would have 3 personnel times one pass. Plus, you would get some savings on fuel and truck wear, since the truck would only have to drive the length of the street once. As an added bonus, you would have less noise pollution, and only have to hold up traffic once per week instead of twice. This would only work for narrow streets, where cars can't pass the garbage truck. So they would need to re-jigger the routes, and have trucks with a one plus one labor model handle the wider streets. Earplugs! Can you think of a more humdrum, disposable product? One of my favorite things to see at MOMA is ordinary objects, held up for the elegance of their design. I bet Howard Leight enjoys the fact that his products are included in the same museum as paintings by Picasso and van Gogh. So the BMW "value service" is $79.95 for an oil change? And they are trying to convince me that they aren't expensive? I read this ad as a warning not to buy a BMW, as the service costs 2-3x what you would pay for a regular car. "The Same, Only Better" ?? Advertisements for financial institutions can be pretty lousy, but this is my favorite in the "No content" category. And what's with the guy in a suit playing with a soccer ball? Maybe this billboard is supposed to appeal to all those guys who like to play sports while wearing a tie. I'm looking for a good, professional babyproofing company to babyproof my apartment in Manhattan. I would appreciate recommendations. It is actually quite simple to keep babies out of your apartment; you really don't need a professional company to help you. Babies, particularly the younger ones, are not very mobile, so a low physical barrier is sufficient; you don't even need to have your door closed. As they get older and enter the toddler stage, they do become more clever at outwitting adults; but simple precautions such as locking your door and keeping the windows shut work fine, in my experience. More elaborate precautionary measures, such as moats with a drawbridge, rings of fire, tiger traps, etc, while recommended by experts, are unnecessary, at least with Manhattan babies. Babies from the outer boroughs can be more aggressive about finding their way into your apartment, however. If you do find yourself with babies getting into your apartment, crawling around on the carpets, eating your food and leaving traces of it on the floor, etc, check with your neighbors: are they having problems as well? Ask your building superintendent: supers are often able to provide free useful advice. Sometimes, folks have no problem with babies until they take a long trip: then they return to find several babies crawling around the floor. Don't worry, babies will be kept away by the noise one makes throughout the day, and this isn't likely to recur as long as you are around. If you are having problems with young children getting into your apartment, then that is an entirely different matter. Finding a "school" or some "activities" can help keep the children out of the house during the day, but they typically return to the apartment at night. I should know. My wife and I have three children running around, and the professionals that we've consulted tell us that it may take up to eighteen years before we're able to get them out of the house. Back in December, I wrote some suggestions for real estate agents. Among the suggestions was: stay in touch with your customers once the deal is done. One report by the National Association of Realtors found that more than 90% of all homeowners are never again contacted by their real estate agent after the contracts for the home are signed. Why bother... there's no money in it, just the possibility of complaints. Well, the reason is obvious--you'd come by with cookies and intros to the neighbors if you cared. Here is Seth's suggestion: Care more. The unsubscribe button on commercial email from ethical marketers is a helpful invention, both for the recipients as well as the sender. The act of unsubscribing sends the marketer useful information, and saves them a very small amount of money on future email blasts. We need an unsubscribe button for physical mail. For recipients, it would be nice to have a less cluttered mailbox. And for direct marketers, it would be a boon to be able to save money by not sending materials to people who definitely aren't interested. Currently, there is a market failure, though, because there is no easy way for me as a direct mail recipient to inform the sender to stop sending me mail. I suppose I could write them, or try to call them up - but that is more trouble than just throwing the junk mail away. Plus, I have a low level of confidence that even if I DID call them or send them a letter, that they would get the message through the organization to the right person and actually remove my address from their mailing lists. Seems to me this is a business opportunity. What I'd like to be able to do is use an app on my phone to snap a photo of any direct mail from an organization that I don't want to mail me in the future. I upload it to the site, and the site takes care of identifying the marketer and getting me off their list. The service would be free to recipients, and paid for by marketers. It costs the marketer at least 50 cents each time they mail me, I would guess, so they ought to be willing to pay $1-2 to the intermediary. I know that we already do have the National Do Not Mail list, but this seems to be to be a blunt instrument. There are in fact some special offers that I want to receive, so I don't want to get my name off of every mailing list. A couple weeks ago I wondered why Harvard has lagged behind in the open courseware movement among top schools. An article today says that Harvard and MIT are teaming up with a $60 million initiative, creating a venture called edX. Harvard will be piggybacking on MITx, the platform the Massachusetts Institute of Technology has developed for its own MOOCs, the universities jointly announced on Wednesday. The combined venture will be a nonprofit called edX. Harvard and MIT together have committed $60 million to the project, which is likely more than the combined venture funds raised by Coursera, Udacity and Khan Academy. Sitting outside the U.S. and want to read a U.S. website as if you were sitting in the States? I don't encounter this problem often, but a friend who lives overseas recommends Ultrasurf. I'm told this can overcome issues such as: Amazon offering a free download to consumers in the U.S. but charging if you are abroad. The proxy server apparently also helps if you happen to be in a country with a regime that likes to read over your shoulder. Got a kid? Does your kid ask questions? Then write some of them down. How does God make people? How can God make make babies and help them grow? What moves my food from my mouth to my stomach? How does my body use the food? Why do daddies go to work? What is the cat saying? Why is she going outside? When is Valentine's Day coming? "Why does the moon keep following us?" One of the best ways to eliminate unhealthy foods from your diet, I've found, is to cultivate a sense of disgust. That can be a more powerful emotion that the more intellectual desire to switch with type of omega fats you are eating. The impact on me: I now eat only meat that I've raised myself. That may not be an option for everyone, but if you switch to buying only grass-fed, organic beef directly from the farmer, you'll spend more, but you'll probably eat a lot less meat of much higher quality. I didn't find this book as compelling, but if you want a lot more details on nutrient contents, what type of fish has less impact on the environment, and so forth, this is the bible. If you are mindful about making every meal an adventure, you'll be less likely to eat junk. You may have cravings for a couple of days, but it is surprisingly easy to do. I gave up sugar in late January this year and have no cravings at all for dessert. If you give up sugar, you'll most likely start eating more fruit. And you'll start being able to taste real food again. And as a side benefit, the vast majority of junk food will be off limits. The On-Purpose Person is free to download until Saturday, April 28. The main idea is that to have a successful life, you need to have a purpose. I assume the meat of the book helps you define what that purpose is. The small time investment of memorizing the number of one of your credit cards, along with the expiration date and security code, is well worth it. You'll save time when buying stuff online and on the phone. Plus, there is a slight security advantage. At some point, you'll be buying something on the phone while you are on the go, and knowing the number means you won't have to pull your credit card out of your wallet while you are walking along and carrying a couple packages, with the chance of dropping or losing your card. You don't need to remember phone numbers any more. A credit card is one number worth knowing. Within ten years, and perhaps five, I think will we have a new term for self-published. That term will be: published. ...before they installed a TV at the pump. Now I swing by the gas station to catch my favorite show. Paul Graham's essay "Frighteningly Ambitious Startup Ideas" got me thinking about other problems that I'd like someone to solve for me. Some of these might be preposterous or impossible, but I would have said the same thing about Pandora or Shazam 10 years ago. "You can't manage what you can't measure" says the cliche, and it is awfully difficult to track all expenses in a household. Mint.com has about the best solution that I know of - it can pull in info from your checking account and all your credit cards. But it is still a hassle to track cash expenses, and to categorize spending. If you spend $300 at Wal-Mart, how should that get categorized? It could be a new gas grill or clothes (hope not) or groceries or diapers. The solution needs to be able to see not just the vendor, but all the line items. 2. A tool to plan out our family menus, keep track of what is in the refrigerator, and order the necessary ingredients from Fresh Direct (or give us a shopping list if we didn't live in New York City.) This doesn't seem particularly far-fetched to me. If Pandora can learn my preferences and pick songs, then a program could certainly learn our food preferences and plan out our menus. And it ought to be able to detect what we put in the fridge. And include in the menu plans nights where we would defrost that extra stew that we frSuoze two months ago. When I was at a big consulting firm, it was nice being able to call the travel office and ask them to book me travel to a given city, with a car, and a hotel in a certain part of town. The call would take two minutes; or could even be accomplished with an email. Now I book all my own travel, starting with kayak.com to find airfares - I'd like some software that would learn my preferences and do that for me. There may already be a good tool out there that I'm just not aware of. I'd like to be able to enter all the books I've read, rate them, and then have a recommendation engine suggest more books and articles that I ought to read. Amazon has its suggestion tool, but I think it is only based on books I've purchased. The tool should be designed to surprise me with content that I normally would not have come across, as well as bring me the articles that I would definitely want to know about, such as anything new by Malcolm Gladwell, John Stilgoe, or James Surowieki. Yes, I know there is Angie's list. But I tried that site a few years ago and it was so clunky that it was unusable. I want to find a medical doctor, a car mechanic, a graphic designer, an attorney, etc., who is recommended by people that I trust. I don't spend much time on Facebook, but this seems like a valuable application that could be integrated to Facebook. LinkedIn has recommendations, but they all read the same, and they have to be approved by the recipient, so they are of little value. One way I know this is an unmet need is that I see emails on listservs of Columbia Business School alums every day asking for an introduction to an attorney who specializes in a certain area, or for a website designer, or a nanny. 6. I'd like my phone to detect how many calories I'm eating throughout the day. And then provide that info in graphical form, e.g., calories eaten per hour. Calories classified by type. Etc. 7. Smart software to prepare my taxes. The software that does exist is almost as much of a hassle as filling in the forms by hand. 9. The immersive reading experience of the future. I'll write a future post on what I'd like out of this one. I don't like to shop for clothes - particularly the time it takes. I'd like a tool that monitors what I have in my closet. It will learn my preferences by monitoring what I wear most often, as well as by asking me to pick A or B from a whole series of choices and then doing conjoint analysis. Then the tool would combine its knowledge of what I have in my closet, with its knowledge of my preferences, plus a separate module monitoring fashion trends. Combining those sources of information, it would occasionally order me new clothes when it thinks I should get them. I would rate its choices, and could send back what I don't like. It could also have the option where I would pay a premium to have another person rate how the clothes look on me, and then incorporate those ratings into the decision. I've never thought of saying this after spending 30 minutes reading to my son or doing a project with my daughter. But I've heard this is a common reaction after watching a tv show. According to the American Time Use Study, Americans spend an average of 2.7 hours per day - that's 18.9 hours per week - watching television. Going to be making multiple visits to the same hotel over a period of several weeks or months? Instead of bothering to book online or go through the 1-800 number, get the contact info for the corporate sales person at the property. Then you can just send an email with all of your dates to that person, and they will make the reservations for you. And if you need to change or cancel a bunch of them, just an email does it, instead of spending a bunch of time online or on the phone. Yale has Open Yale courses - a wide selection of courses that are free online. MIT has 2000 courses online and free at MIT OpenCourseware. 58,000 people took an artificial intelligence course at Stanford for free. ...a grand total of four professors. Want to contact someone directly on LinkedIn? A trick that seems to be not universally known is that if you are in the same group as a person, you can send her a direct message, even if you are not connected to her. This proves very useful if you are doing research on an industry. Join some groups that are popular, and you can scroll through the membership and send people a direct message with a question, or invite them to connect. Note: the default is that someone in a group you join can contact you directly, but there is an option to opt out and block messages. In my experience, only a small percentage of people opt out. What religious pilgrimage in the world attracts the most visitors? I would have answered that the hajj, the annual pilgrimage to Mecca, attracts the most pilgrims. India’s festival of Kumbh Mela, held every six years, is much larger. As many as 70 million Hindus attended in 2007. An interesting example of the availability bias. I've certainly heard a lot more about the hajj than about Kumbh Mela. 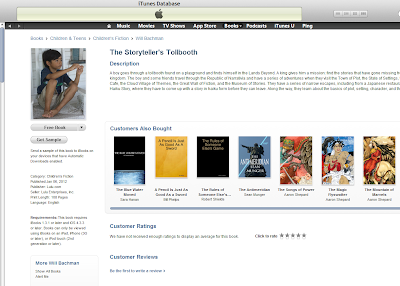 I was pretty surprised when I checked Lulu.com a couple days ago and found out that "The Storyteller's Tollbooth," the book I wrote my son for Christmas, has been downloaded 360 times. I would have been surprised by five downloads. It still wasn't available on Amazon.com, though, even though Lulu seemed to indicate that it would be. 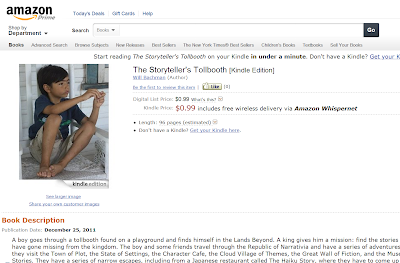 So I went ahead and self-published the book on Amazon, via the Kindle Direct Publishing program. It is remarkably easy, and takes just a couple minutes to publish anything you've written. The minimum price you can charge, however, is 99 cents. They don't let you make it free. 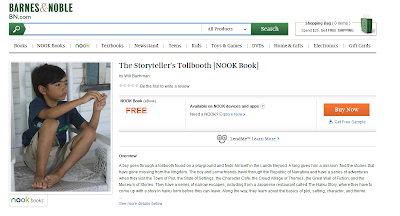 The advice that I found on the web, though, is to click on the "tell us about a lower price" link and include the B&N link, where the book is free. So I'll try that and see if Amazon lowers their price. I haven't heard back from anyone who has downloaded the book, so I don't have any idea if anyone has actually read any of it. And there are no reviews, so I don't have any idea of anyone may have thought of it. (Other than my son, who enjoyed being a character in a book written by his dad.) So it is interesting to feel firsthand the experience that I imagine many authors get when the book is released into the world. I'm always impressed when this happens. Do photo editors get embarrassed about it? I gave a talk last night at Columbia Business School on how to start and run your own consulting firm. Here are the slides I used. I'm working on a handbook with a set of practical actions that will be a lot more comprehensive that these slides. I expect to post that handbook here on the blog within the next few weeks. I'll also be answering the questions that attendees included on the feedback form (which is also included below the slides). One answer: the library in Manhattan with fantastic electronic resources is the Science, Industry, and Business Library, part of the NYPL system. It is at 34th and Madison. To access the electronic documents, you need to go in person to the resource center downstairs. Bring a USB drive to take home your files. They have free analyst reports via a service called either Investext or Multext, which is owned by Thompson Reuters. I always find it helpful to collect feedback when giving a talk. Here is a form I developed which I think works pretty well. I hand it out at the beginning of the talk and make it clear how helpful the feedback will be. When I'm at home, I can never find time to read. I get home from work, then it is dinner, getting the kids a bath, playing with them or reading to them, and by that point I'm ready to go to sleep myself. The days when I could curl up with a book for two to three hours are long gone, and I've missed that experience. Then this year I started listening to audiobooks regularly, and a whole new field of opportunity has opened. On my morning run, and then on my commute to and from work, I've been listening to audiobooks. I can often get in about thirty minutes on my run, and thirty minutes each way to work. That is an hour and a half per day. I've started to think of books in terms of hours rather than pages. A shorter book is 6-7 hours, a long novel like Crime and Punishment runs about 20 hours. With the audiobook everything - pace, timbre, inflection - is determined for the captive reader. The collaborative component is gone - one simply receives. Perhaps this is a disadvantage for a professional critic and reader like Birkerts, but for me audiobooks provide a superior artistic experience to reading the book myself. This is particularly the case for fiction based in a time or setting distant from my own, with a lot of accents or difficult to pronounce names. I feel I understand Wuthering Heights far better after listening to a professional perform the Yorkshire accent of the old servant than I would trying to read it myself. Same applies to the African-American voices in Their Eyes Were Watching God. I recently opened a savings account for my seven-year-old son at a local retail bank. I'd give the experience a score of three on a scale of one to ten. My goal was to start building his financial literacy and help him understand what money is all about and how banks work. Apparently, I wasn't the only parent with this idea. Our neighbors walked in a few minutes after us with their young daughter and the same idea in mind. (They were turned away because they forget to bring ID and the girl's SSN.) And another banker was enrolling another young saver while my son was getting signed up. - The banker kept us on the far side of the desk and refused to let us look at his screen. I would have liked my son to see all the information that he had to enter. The banker claimed we were not allowed to watch - something to do with money laundering or catching terrorists. - I was asked if I have any accounts at the bank, and when I said 'No' there was no follow-up. - On the positive side, the banker did show us the machine that printed our new ATM card. + The banker introduces himself to my son by name, and gives my son his card. "Anytime you have any questions, you can call me on this number." + The banker engages my son directly, and welcomes him to the bank. "First, before we sign you up, let's take a quick tour of the bank so you can see what we do here." We get a tour of the vault, of the cash-counting machines behind the counter, etc. + The banker gives my son a short book, designed for his age range. The book explains with simple diagrams and examples how a bank works. + The banker gives my son a worksheet on goal-setting. "Is there something in particular that you'd like to save up for? Do you know how much it will cost? When would you like to buy it? Let's figure out how much you need to save each month to be able to have enough by then." + My son gets invited to a class on financial literacy for kids ages 7-9 that will be held at the bank two weeks from now. + "Before you leave, I'd like to introduce you to the manager of this branch, who always likes to say a few words to young savers." Those are a few ideas off the top of my head. That would be an experience I'd tell friends about. So why bother to create an extraordinary experience? Because the type of parent who wants to open a savings account for a child represents, more often than not, the potential to be a lucrative customer. And creating an extraordinary experience for the child would probably cost less than the comparable acquisition cost of that customer. To my knowledge, no retail bank in New York City owns this space, as the go-to bank if you want to open an account for a child. What if you could list only the education you've completed in the last year? Would that change how you manage your own professional development? How relevant really is the famous college you attended one, two, or three decades ago? Without the brand name, is the education alone worth your time and student loans? Back in November, I wrote about my effort to stop receiving credit card offers. Update: It worked. I haven't received any credit card offers for several months. Unfortunately, I'm not sure exactly which of the tactics is responsible. 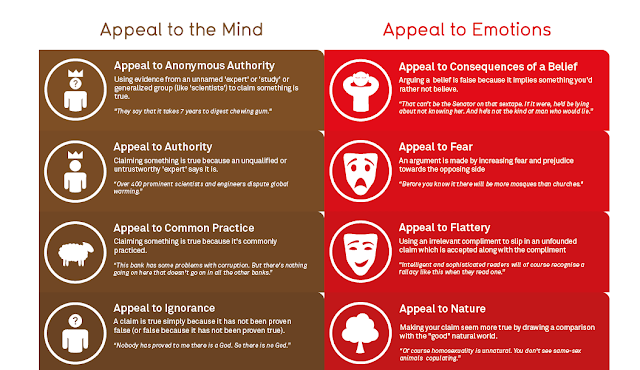 The blog Information is Beautiful has a wonderful graphic on the rhetorical fallacies and logical errors that we make. Here is just a sample. Click on the link above to see all 55 fallacies. Keep track of what trees you planted, and where you planted them. Don't rely on those tags, which will get lost. Make a map, note each location, and then save the map in a safe spot. Preferably, email it to yourself. Note when you planted the tree, the name of the variety, and where you bought it. I failed to follow this advice in 2010 and 2011 when we started our orchard, and now we have nine mystery trees growing. But we're keeping track of the trees we plant this year. When I sit down to set goals, I generally think about the additional activities I want to add to my life. But I know that I need to make space for the new activities, so I also work on setting goals about what I will stop doing. Emotionally, it is a lot easier to buy a new shirt than to take a shirt in my closet to the thrift store. Same thing with activities, but there are only 24 hours in the day. We hear a lot about the budget deficit these days. We used to hear a lot about the trade deficit, but we've had one of those so long, and nothing bad seems to have happened, that politicians don't pay so much attention to that one anymore. But we don't hear a lot about the National Follow-up Deficit. Have you seen signs of it? Once you start looking for it, you find signs of it all over. + From time to time during the summer, I'll hire someone to help do some yardwork. Of the dozen or more people that I've hired over the years, only one has ever called me up the following year to see if I needed more help. + I was looking for a vacation rental for a ski weekend, and sent inquiries to ten different properties. Only three of them got back to me with an email, and none of them tried a second time, even though I included my phone number. I know that I'm at fault here too, and that someone looking over my shoulder could find plenty of examples where I've failed to follow-up. But am I wondering: what would it do our GDP growth, the unemployment rate, and overall life satisfaction if we were better at following up on opportunities? How could you teach that?